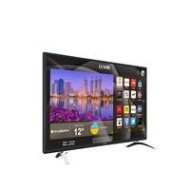 alaTest has collected and analyzed 215 reviews of Luxor 55 inch Ultra HD 4K, Freeview Play, LED, Smart TV. The average rating for this product is 4.3/5, compared to an average rating of 4.6/5 for other products in the same category for all reviews. Comments about the size and sound are overall positive. The usability and image quality are also appreciated, whereas there are some critical opinions about the tuner and durability. Views are divided on the connectivity. We analyzed user and expert ratings, product age and more factors. Compared to other products in the same category the Luxor 55 inch Ultra HD 4K, Freeview Play, LED, Smart TV is awarded an overall alaScore™ of 89/100 = Very good quality. Far from 4k and no where near ultra hd but deffo on a hd level with the size, price and smart tv feature it's awesome! Would be better with the Amazon prime app like my Samsung smart tv. I got this last week along with the wall bracket and WOW so very pleased we chose this it is amazing the picture and sound is so good. Had TV less than a year. Sound dips in and out. Now its turned off and wont turn back on. Gets rid of all the boxes, Netflix, YouTube and many others straight from this smart TV.